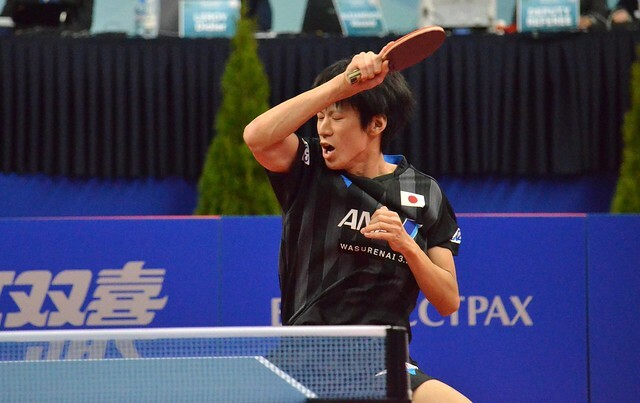 Winner just under one year ago at the Finlandia Open, a tournament organised on the progressive knock-out system, a semi-finalist earlier this year in Slovenia, Japan’s Minami Ando was the player to upset the order of merit at the quarter-final stage of the Women’s Singles event at the 2018 ITTF Challenge Belgosstrakh Belarus Open in Minsk on the evening of Saturday 17th November. The no.5 seed, she accounted for Chinese Taipei’s Chen Szu-Yu, the no.3 seed, in six games (11-8, 11-7, 11-8, 1-11, 4-11, 13-11), a round that underlined the theory all defenders are different, even though from the same country. Notably compatriot Miyuu Kihara, the no.15 seed, beat qualifier Maria Dolgikh (11-9, 11-9, 11-4, 11-6) but in a second contest that featured a Japanese attacking player versus a Russian defender, it was defeat. Sakura Mori, the no.19 seed, suffered at the hands of Polina Mikhailova, the no.6 seed (11-7, 11-7, 11-7, 11-7). The win recorded by Miyuu Kihara belied her teenage years, she is only 14 years old; Maria Dolgikh, the Cadet Girls’ Singles winner in 2001 at the European Youth Championships in Terni, is now 31 years of age and with a wealth of experience. Was such a convincing win to be anticipated? Conversely; was the straight games win recorded by Polina Mikhailova, even though the higher seeded player, not somewhat of a surprise? Polina Mikhailova and Sakura Mori had met twice previously on the ITTF World Tour, on both occasions, Sakura Mori had prevailed; on the ITTF World Tour in 2006 she had succeeded in the Czech Republic, significantly two years earlier in Minsk! Success for Sakura Mori meant that an all Japanese penultimate round line up was avoided; in the remaining quarter-final duel, Saki Shibata, the no.2 seed, repeated the feat of the previous week in Austria; she beat Slovakia’s Barbora Balazova, the no.11 seed, in four straight games (11-9, 11-2, 11-8, 11-6). At the semi-final stage Miyuu Kihara meets Polina Mikhailova, Minami Ando opposes Saki Shibata; the matches are scheduled to commence at 10.00 am (local time) on Sunday 18th November.